We’ve talked quite a bit here at Grief Compass about mindfulness and narrowing your focus toward your breath in moments of emotional overwhelm. Today we wanted to dig a little deeper and connect you with an expert resource if you’re interested in incorporating mindfulness practice into your daily life. This is a perfect beginners guide to mindfulness. I know talking about meditation can sound a little woo-woo, but all meditation really is, is training your mind to focus and eventually relax. You don’t have to seek some sort of external spiritual enlightenment, you just sit with this moment as it’s happening. The physical and psychological benefits of mindfulness practices are well documented, and on the topic of mindfulness and grief there is no one better to learn from than the woman who literally wrote the book on it, Heather Stang. 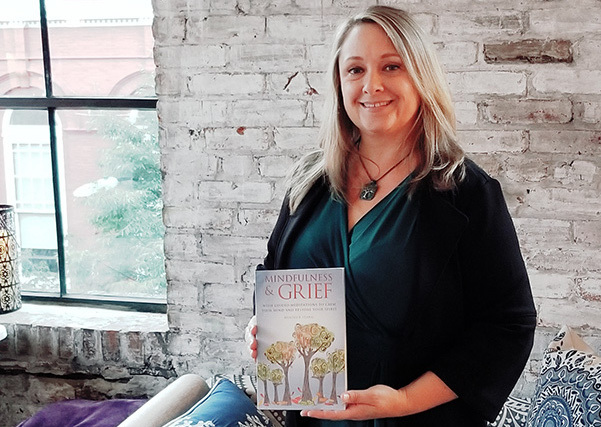 Her fantastic book, Mindfulness and Grief takes you through eight weeks of mindfulness practices which allow you to “calm your mind and restore your spirit.” Her very straightforward and accessible approach to meditation touches on many of the topics we’ve discussed in Grief Compass and adds a direct element of mindfulness to them. We’ve partnered with Heather to bring you “Week 1 Practice Exercises” from Mindfulness and Grief which will help you figure out if this practice is a good fit for you. If nothing else, it’s very relaxing. Take a few minutes, get comfy, and give it a try. In this practice your breath is your home base, a safe place to rest your attention. Know, going into this practice, that your mind will wander off from time to time. One moment you will feel your breath, the next you will be remembering, daydreaming, worrying, crying, or dozing off. This is totally normal. When you catch yourself doing anything other than noticing your breath, simply begin again. Pick up where you left off, without judgment. Lie down on your back somewhere quiet where you will not be disturbed. It is important for this exercise that you begin as comfortable as possible. Place a rolled-up towel, blanket, or pillow beneath your knees to reduce pressure on your lower back. As your body becomes more relaxed, you may begin to feel cool, so cover yourself with a blanket or keep one handy, just in case. If you are feeling sleepy, you may choose to sit on a chair or cushion, or stand. There is an increased chance that you will fall asleep when lying down. While the mission of mindfulness is to wake up to your experience, if you are in the acute stage of grief or are having trouble sleeping, rest may be just what your body needs. Choose what will best support your intention for practice. 1 Get comfortable and close your eyes. If you are lying down, allow your arms to settle by your sides, palms up. If you are seated, place your hands palms up in your lap. Close your eyes. 3 Find your breath. Discover the place in your body where your breath is most noticeable. It might be your belly, your throat, or your chest. 4 Observe your breath. Feel the rise and fall of your breath with each inhalation and exhalation without changing its natural flow. If it is shallow, notice that it is shallow. If you feel tightness in your body when you breathe, notice that too. Right now you do not need to change anything or do anything special with your breath. 5 Get curious about the sensation of your breath. Imagine that this is the first time you have ever noticed your breath, and be aware of how each inhalation and exhalation feels. Maintain a sense of childlike curiosity and notice that as you observe your breath, the sensations may change. 6 Expand your breath in your belly. Soften your stomach muscles. Let your next inhalation fill up your belly like a balloon. Hold the breath for a moment or two longer than you normally would, and then exhale. For now, let your breath stay in the lower third of your torso; your belly area. Stay engaged and curious. Repeat this at least ten times. 7 Expand your breath to your midsection. On your next inhalation, fill your belly with breath as before, and then continue to expand your breath into your midsection, just below your rib cage. Hold your breath for a moment longer than normal, and then exhale. Allow your breath to leave your midsection, and then your belly area. Repeat this at least ten times. 8 Expand your breath to your chest. On your next inhalation, fill your whole body with breath. Now you are inhaling in three parts. First into your belly, then your midsection, then your chest. Again, pause a moment before you exhale. Release your breath first from your chest, then from your midsection, and finally from your belly. Repeat this at least ten times. 9 Let your exhalation fall out of your mouth. Inhale in three parts, hold your breath for a moment, and then allow your exhalation to spill out of your body with a sigh or any sound that feels natural. Repeat this at least four times. 10 Observe your organic breath. Now just let your breath come and go naturally and in its own time. There is no effort on your part now. Witness your breath without judgment, along with all the other sensations of body and mind that come and go. Allow your focus to stay with your breath for as long as you wish. Do you at the least feel a bit more relaxed or unburdened? Hope fully you do. Heather is a fantastic mindfulness instructor and if you want to find out more about Grief and Mindfulness you can get her book on Amazon (we don’t get paid for this, we just really like her stuff), you can subscribe to her podcast, try one of her free online guided meditations, or visit our next Grief Compass blog where Heather will expand into mindfulness meditation and mindful journaling.